This past summer, after I left my job, I decided Dek and I needed to get active. I had never made time to truly explore Seattle and the surrounding areas. This was my chance. I had unlimited time, but not a big budget. Our exploration could only take a few hours and had to be wrapped up by nap time. I made a huge list of places we would visit. There are over 50 on my list, but we have only been able to tackle a handful so far. 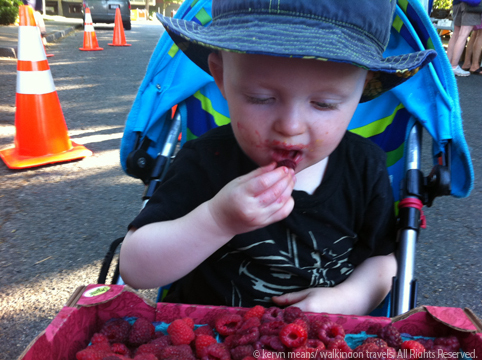 Here are our top favs to bring kids under 5 in Seattle. Many of the spots are great for older kids as well, but I have only been able to test them out on my 2 year old and our friends who tag along for the ride. Our top pick for an outside adventure has got to be Kubota Garden. It’s a hidden gem in a neighborhood no visitor would think of going to. 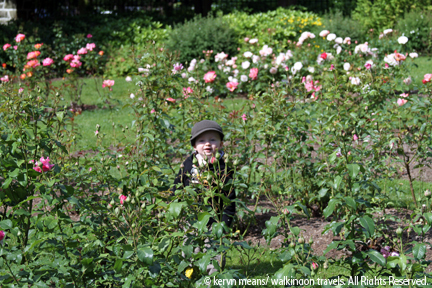 It is free and your kids are able to wander about, exploring the small paths, bridges and humongous trees. The staff is there to maintain the property but rarely seen allowing parents the chance to kick back a little and not freak out every time their child wanders off the path. Food pick: I don’t know of much close by, but that shouldn’t stop you. I usually pack a light picnic to bring along and eat at the top of one of the waterfalls on a bench. Or we plop ourselves down on the grass or a few stones to chow down on. I’m not sure you can ever go wrong with a visit to the Woodland Park Zoo. It’s not too big that you can’t cover most of it, but it’s also not so small that you don’t want to go back for a second look. There are plenty of interactive learning activities throughout the zoo especially in the summer. The petting zoo is getting more exciting the older Dek gets (and the less afraid he becomes.) Zoomazium is a big hit for the under 5 crowd. Parents love it because there is a separate section for crawlers and a big climbing structure for the kids that can run and jump. Even better, it is all inside, which makes it a great stop on a rainy day. Food picks: Redmill Burger (312 North 67th St, Seattle) is our favorite burger place in town. The lines are long on the weekend for a reason. Maybe it’s that huge stack of crispy bacon on the grill or just their secret sauce. You may never know unless you check it out for yourself. If you get tired of the zoo there is also a playground just outside of the gates on the north side or you can head to the south side into the Rose Garden, which is free to the public and just outside of the zoo gates. When your kids still aren’t getting enough animal adventures head downtown to the Seattle Aquarium. It is small but great for tiny hands to do some exploring. The only downside is that parking can be expensive and the crowds can be overwhelming during the height of tourist season. If you can come off-peak or are staying downtown it is definitely worth a trip. Food pick: You can’t go wrong with a wander through Pike Place to grab some food after a visit to the aquarium. My favorite is the sandwich counter at Three Girls Bakery (1514 Pike Place, Ste., at Post Alley). It is across the street from the fish throwing guys. Ask around and a vendor can point you in the right direction. Directly across the street from the aquarium is some amazing Mexican food at El Puerco Lleron (1501 Western Ave, Seattle.) Homemade tortillas really do make all the difference. My favorite beach in the city has got to be Golden Gardens. The water is freezing but when did that ever stop a toddler from jumping in? There is sand, the sound and plenty of room for kids to play. Golden Gardens is also home to one heck of a playground, a grassy field for kids to run around in and some wetlands to explore. Parking is free but watch out. If it is sunny and even slightly warm you will be fighting with locals over a parking spot. Food pick: With Ballard so close by you can easily pack up a picnic lunch. Even better, bring some firewood and hot dogs to grill in the open fire pits scattered around the beach. Grab a group of friends to watch the sunset or just make lunch for you and the kids. Just be sure to put your fire out before you leave. Neighborhood Farmers Markets run year round in Seattle. Sure you could join the crowds at Pike Place Market for some fresh eats; I often do if I need to pick something up and I happen to be downtown. I love the neighborhood charm of the farmers markets scattered through the city though. You get a little more room to breathe. You can take in the entire neighborhood, meet the locals, chat with the vendors and have some great food at the same time. One of our favorite markets is the in the Ballard Neighborhood on Sundays. We pick up our produce for the week, grab a flat of berries for cereal, and chow down on some wood-fired pizza, crepes and tamales. Some of my favorite boutiques are also in the area for a little extra mommy shopping. Food pick: Go to town on whatever is available at the markets. Pull up a piece of curb, sit yourself down and enjoy some of the street musicians playing away. If you must sit in a restaurant you have your pick. Some of the best, in my opinion, restaurants can be found in Ballard including La Isla (Puerto Rican) and La Carta de Oaxaca (Mexican). Seattle is known for its green spaces and with good reason. Discovery Park is a must visit if you enjoy hiking through meadows, forests and along a sandy coastline. There is a little light house for families to check out, although on my last visit you still couldn’t go inside. The driftwood piles can keep everyone entertained for hours though as you build forts and castles to hide in. If you need to get in your exercise, head over to Green Lake, right by the Woodland Park Zoo. The inner loop is about 3 miles around and always busy with people, strollers and dogs, but that should not turn you off. The views are amazing and it’s great to have so much motivation to keep you moving. There is a wonderful playground here as well for the kids to play at with one parent while the other sneaks in a run. In the summer there are 3 beaches set up with lifeguards, diving boards and slides. Boats are also available to rent. If the weather is nice, you will probably see me there. Food picks: Grab yourself a coffee and a croissant at Urban Bakery (7850 E Green Lake Dr N) before walking down to the playground or taking on the 3 mile loop. Zoka Coffee Roaster (2200 North 56th Street) is also just a few short blocks off the park if you are a coffee connoisseur. A plethora of food choices line the north side of the park if you find yourself needing a little more than coffee. 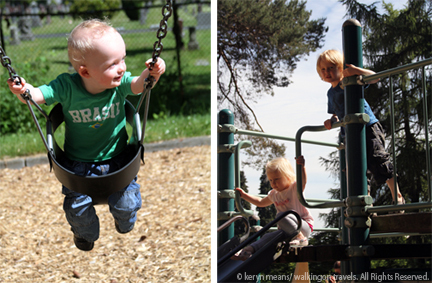 One of our favorite playgrounds these days is in Volunteer Park. There is gear for kids of all ages, a sandbox, several slides and loads of swings. If you are into walking through cemeteries, you can go say hi to Bruce Lee just behind the playground in Lakeview Cemetery. Don’t worry there is a big fence to separate the play area from the not so recently departed. The park also has several walking paths and a conservatory you can pop into. Volunteer Park is also home to the Asian Art Museum if you want to sneak in a little culture as well. Check the museum sight for free visiting days. Food pick: The Volunteer Park Café (1501 17th Avenue East Seattle) has a little something for everyone along with seating to plop yourself down on when it’s just too darn cold outside. You can also get orders to go if you want to picnic in the park. Admit it. You can’t wait to dive into some local adventures too.